School of Law Dean Daniel Rodriguez, M.K. Pritzker, J.B. Pritzker, University President Morton Schapiro and Board of Trustees chairman William Osborn attend the announcement of the Pritzker family’s $100 million donation to the School of Law. The school was renamed the Pritzker School of Law in honor of the Pritzkers’ gift. 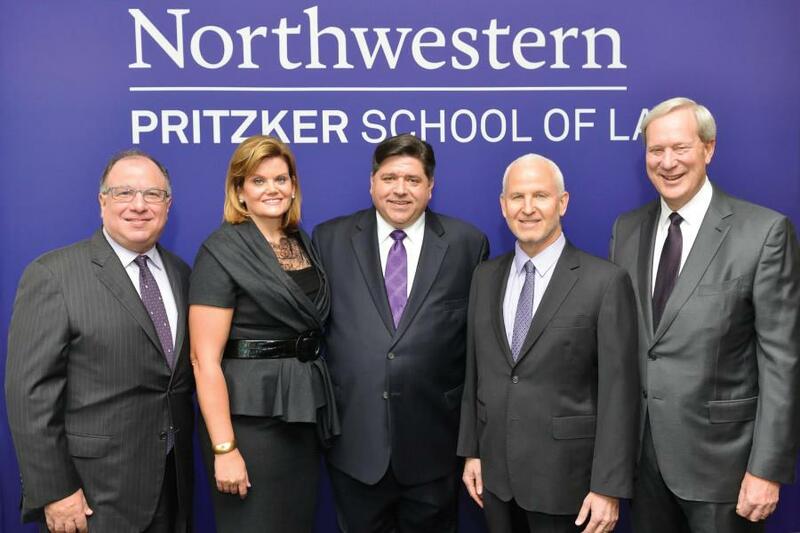 With one of the largest gifts to a law school in the nation, J.B. Pritzker (Law ’93) and his wife, M.K. Pritzker, made a $100 million donation to the School of Law, the University announced on Thursday. Bill Osborn, chair of the Northwestern Board of Trustees, said the school will be renamed the Pritzker School of Law. Thursday was a major turning point, both in the history of the School of Law and the history of legal education, Osborn said. Reaching such a point requires fundamental pieces to be in place, including a visionary but viable strategy as well as resources and talent needed to implement that strategy, he said. “The strategic plans for our university and the law school guide us to excel in critically important academic areas where we can, and should, be national and global leaders,” Osborn said. University President Morton Schapiro said the Pritzkers’ gift will have a significant financial impact on students pursuing law degrees at NU. “With this transformative gift, we leap ahead in our ability to provide a Northwestern legal education to all our best students, regardless of financial circumstances,” Schapiro said. The School of Law is the seventh of NU’s 12 schools to be named after a benefactor or leader, he said. The gift will support multiple social justice centers at the School of Law, including the Center on Wrongful Convictions, the Children and Family Justice Center and the Center for International Human Rights. “This remarkable gift will allow us to expand our work in these unbelievably critical areas,” Schapiro said. In addition, the gift will permanently endow the school’s Entrepreneurship Law Center, renaming it the Donald Pritzker Entrepreneurial Law Center in honor of J.B. Pritzker’s father, Donald Pritzker, co-founder and former chief executive of Hyatt Hotels Corporation. “The Donald Pritzker Entrepreneurial Law Center … will not only instill an entrepreneurial mindset in all of our future lawyers, but it will allow us to build on our pioneering Master of Science in Law program for professionals in the scientific, engineering and medical fields,” Schapiro said. Schapiro said the intersection of law, business and technology is a key to the nation’s economic prospects. NU is already known for its willingness to break down disciplinary barriers, and the School of Law will lead future efforts in interdisciplinary studies due to the donation, he said. School of Law Dean Daniel Rodriguez said the law school’s commitment to excellence revolves around developing and nurturing a mission that enables law students to do their best to represent and advocate on behalf of clients, facilitate the progress of the nation’s economy and advance social justice. “This gift, magnificent as it is, does not define our commitment to excellence and innovation, but it truly helps enormously in promoting our plans and creating the conditions by which we will meet our highest objectives and accomplish our greatest goals,” Rodriguez said. J.B. Pritzker, a life member of the Northwestern Law Board, joined the University’s Board of Trustees in 2004. M.K. Pritzker serves as a trustee of the Northwestern Memorial Foundation. The Pritzkers’ gift is part of NU’s “We Will” campaign — a $3.75 billion fundraising initiative — and it is the fourth donation of $100 million or more at NU this calendar year.